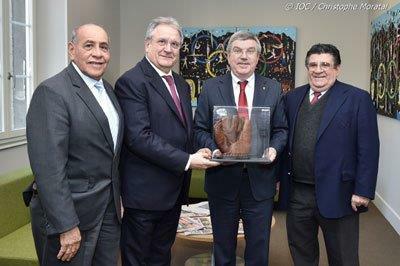 The IOC President Thomas Bach received WBSC President Riccardo Fraccari at the IOC headquarters in Lausanne, accompanied by IOC Member/WBSC Vice President Reynaldo González López and IOC Honorary Member/WBSC Vice President Melitón Sánchez Rivas, to discuss the Olympic programme in the framework of Olympic Agenda 2020 and its recommendations. The WBSC president also reconfirmed baseball/softball's support of Olympic Movement and the promotion of Olympism. A decision on potentially adding new events, such as baseball/softball, to the 2020 Olympic Games in Tokyo is set to be taken at the IOC Session in August 2016 ahead of the Rio Games.